The Type 90 is a Rank VII Japanese medium tank with a battle rating of 10.0 (AB/RB/SB). It was introduced in Update 1.79 "Project X". The Type 90, although similar in design to the Leopard 2A4, does not boast the same superb survivability. Due to the three man crew, it is in your best interests to avoid getting hit if at all. Since there are more weak spots than areas that are protected, you only need to keep in mind that the sides of the frontal turret will block most shots if angled at 10 degrees. The turret ring is very vulnerable, susceptible to penetration by 30mm AP or APDS rounds and gives way to both commander and gunner. In realistic battles, the Type 90 continues the traditional Japanese roles of fire support, sniping, and flanking. You can use this vehicle to rush down the center of the map with its speed allowing it to quickly engage and disengage enemies, negating the downsides of the subpar armor by simply not being hit. With a five second reload time for the cannon, and a high-penetration round, it should only take 5-15 seconds to finish of an enemy tank. Through utilizing the terrain by using suspension to hide the chassis when peeking, and angling armor in a way to force enemies to hit your armored turret, the Type 90 can be a very powerful glass cannon in a battle. Development of the Type 90 began almost immediately after the introduction of the Type 74 into service, with the Japanese High Command already looking for a superior replacement. A central aspect of the new machine would have to be the ability to take on and defeat the new Soviet T-72 main battle tank. With that in mind, Japanese engineers began working on a prototype design, which would see completion in 1980. Two prototypes of this initial design were built, tested and improved upon between 1980 - 1986. Testing resumed in 1986 with a second batch of four prototype vehicles, featuring a number of improvements over the initial two. 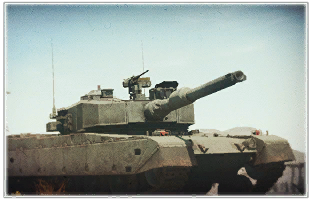 The most significant change included the replacement of a Japanese-made 120mm smoothbore gun with the established Rheinmetall 120 L/44, most notably used by the M1A1 Abrams and Leopard 2 at the time. The decision to change the gun from a domestic one to a licence-built alternative most likely came as a measure to reduce production costs. However, unlike the MBTs of western armies, the designers of the Type 90 opted to equip the tank with an autoloading mechanism, making it the only production vehicle that did so in combination with the Rh 120 cannon. Further testing and army trials of these prototypes was conducted during the late 80s before the Japanese army formally introduced the tank into service in 1990 as the Type 90. Production of the Type 90 began in 1990 and continued until 2009, with 341 vehicles made. 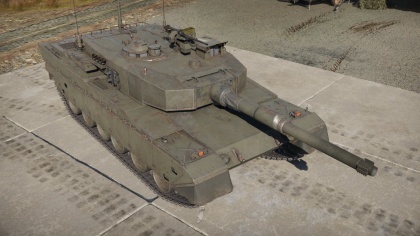 Skins and camouflages for the Type 90 from live.warthunder.com.